With growing employment and academic exposure in overseas countries, the need of Transfer Certificate Attestation became an urge today. 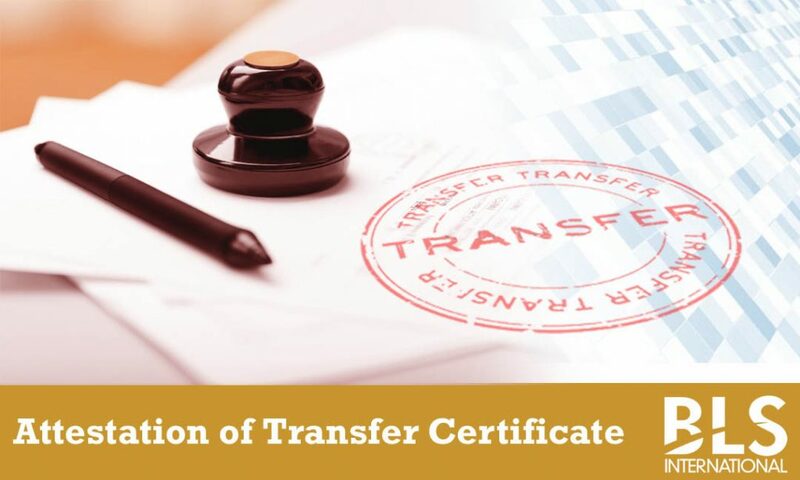 This is an Educational Document required in authorising a Transfer Certificate while shifting from one institute to another; and such certification affirms the genuineness of the document issued by a specific entity/board or authority with its seal and signature. Getting a Transfer Certificate attested is an imperative perquisite today by the respective authority of the visiting nation and institution. To do so, all prospective applicants are required to apply it through any authorised service provider. The act of Transfer Certificate Attestation is carried out from the HRD/MEA and the respective Embassy of the visiting nation. In India, several attestation companies/agencies are incorporated over the years; and one of the acknowledged and authorised service providers in the said domain is BLS Attestation Services. This is a division of BLS International and the organisation is a trusted partner of MEA, New Delhi that manages the administrative function of the attestation processing. Some of the major attestation centers of BLS are located in Delhi, Mumbai, Kolkata, Kochi, Chennai, Bangalore, Hyderabad and Gujarat. Applicants seeking Transfer Certificate Attestation service in any of the cited locations can reach out to the authorised service provider. Here, the entire attestation activity is performed under in-house attestation professionals who take care of each and every application with equal amount of priority so that the application get process without hassle. In addition, the application process and attestation fee is quite affordable at BLS Attestation centers. However, it is to be imparted that for the documents that are generated from Andhra Pradesh, applicants need to provide one passport size photograph for such documents. To apply for the Transfer Certificate Attestation, applicants are required to fill up an application form supported by all required documents. These documents include the original certificate, passport copy, visa copy, degree copy, all year mark sheet, HSC Certificate and the SSC Certificate. Besides availing the Transfer Certificate Attestation service, applicants can also avail here several other services like Translation, SMS, Courier, State Attestation (Home Department / Education Department) and Diplomatic Mission Attestation (Embassies / High Commissions / Consulates. If your Transfer Certificate is under processing, there is nothing to be fret now. Feel free to reach out to any of the nearby attestation center from the above cited locations and get your all kind of document attestation need done with ease. One of the key service attributes of the Attestation centre here is that all the attestation process can be done at BLS even if the certificate holder is not present in the issuing country individually.